At the intersection of hipster and mainstream is a refurbished 1929 Art Deco stunner. Located at amidst the collision of two neighborhoods, Bucktown and Wicker Park, this former office building has transformed with the times into a contemporary hotel equipped with all the necessities of the changing area. Making my way to The Robey was probably easier than taking a flight to Chicago. Hopping onto the Blue Line, the L conveniently drops you off just across the street from The Robey’s entrance. The building was constructed in that oh-so-photo worthy angular style, which means both sides of the building have outward facing views. 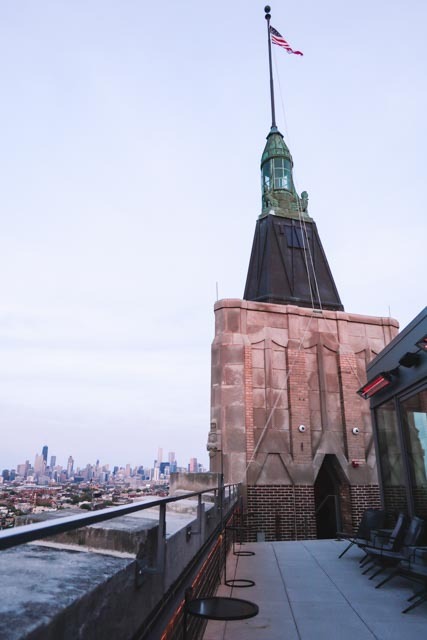 But, the real gems of this 203 foot architectural treasure are the two rooftop bars and private lounge area located in the spire, with 180 degree views of Chicago. Reception offers free in-house baked cookies and coffee daily upon arrival. Several cookies later and I was checked into my spacious Urban King, which includes a separate seating area, heavenly bedding, and a pedestal sink fit for 1920’s glam. 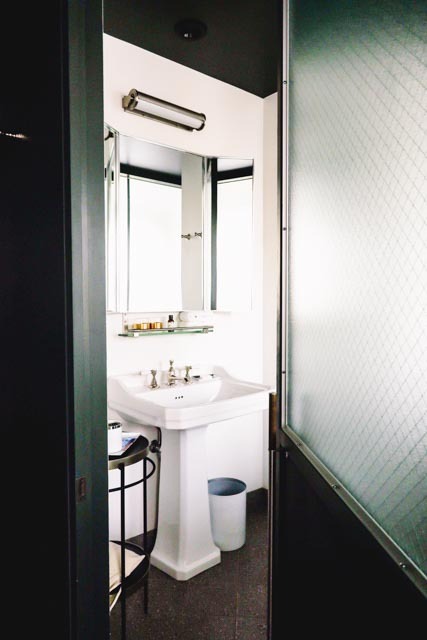 A minimalist color palette, with clean lines and artful nods to yester-year by design duo Nicolas Schuybroek Architects and Marc Merckx Interiors made my stay feel modern yet nostalgic (think Bluetooth sound system made to look vintage). Varying room categories fit all types of travelers, even those who travel with children or with other couples as 20 Annex Lofts provide urban bunkbeds. Bike rental is available by a partnership with Tokyobike, yet it’s the food and beverage that steals the time of many guests…including myself! Two prime spots to indulge are The Cabana Club and The Up Room. Each has it’s own unique indoor/outdoor vibe with craft cocktail menus to boot. The Cabana Club was closed for a private event during my stay, but a quick peak during morning hours offered me insight into this vacation worthy locale. Deep caramel colored leather armchairs and tropical palm leaves is a bit Mad-Men meets Havana Nights, yet the pool and Mexican inspired drinks will have you beachside in mere moments. The Up Room feels part rooftop bar and part speakeasy with its cosy yet cool atmosphere. A whiskey and gin heavy cocktail menu is expertly prepped by trained bartenders, yet those seeking other spirits will do just fine. Indulge in a “Be Cool Hunny Bunny,” and take a stroll out onto the rooftop veranda. Some of the best skyline views of the city can be captured from this 13th floor escape. Beware though - the drinks are stiff, hunny! Breakfast and dinner are taken downstairs in the corner facing bistro Cafe Robey. The cuisine might be modern American, but the tiled floor and marble tables felt more Parisian to me. Settle in for a homey breakfast, which often times is included in the rate. Have a brunch cocktail (again curated in-house), enjoy the duck hash and whatever you do, ALWAYS order one of their pastries. Poppyseed Almond Cake with blackberry butter is a yes! This Chicago neighborhood establishment might not compete with the likes of River North in terms of sheer size and premium downtown location, yet that isn’t what this property aims to be. A “six corners” joint with chic and agreeable rooms, a stellar cocktail program, and easy access to what real Chicago life is like, that my friends is The Robey. Cheers to getting "zozzled" at the retro Robey! Katy is a versatile media professional who likes to refer to herself as a "Jane of all trades". Her written, video, and photography work can be seen on Redbull.com, 49er.org, USSailing.org, and Boston.com. You can follow along with her adventures on her Instagram at @katy_nast .